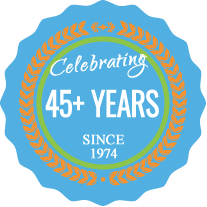 Jack’s Lawn Service & Snowplowing has provided residential snow removal services for homes in the Grand Rapids for 40+ years! Over the years, we have streamlined our services to make pricing and purchasing easier than ever for our customers. In fact, you can sign up and pay online for your residential snow removal services. Our standard service has you covered for a typical Grand Rapids winter starting November 15 through April 1st, plowing up to 77 inches of snow – which is the average for our region. Be sure to check out the optional service add-ons too so you have nothing to worry about this winter. Driveways will be staked with a special marker to identify the driveway and prevent damage. A return trip in spring is included to fix any lawn damage we may have caused, but let us know right away if you see anything sooner. It’s fast and easy! Just sign up online and we’ll do the rest. Our residential snowplowing services cover an area in Kent County from Fulton Street to the North, East Paris to the East and 92nd Street to the South, and West to Kenowa Ave. Some areas have routes that fill very quickly. If we are unable to help you, we will try to refer you to someone that can. What is the minimum snowfall amount before you will provide service? Our minimum snowfall amount is 2″ for residential. 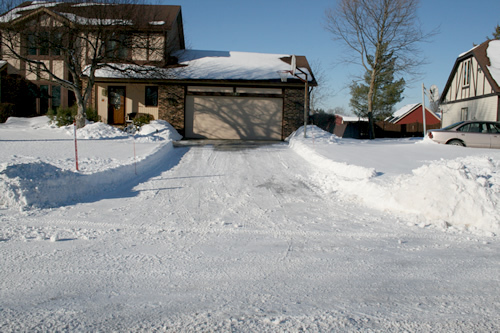 Any time it snows 2″ or more at once, we will automatically provide snowplowing service. How do I know if we reached the 2 inch trigger for snowplowing? We will send out an email by 7 am as to what the weather is, what our plan is, and what has been done. It depends on the plan that you pick. Our standard plan covers you up to the seasonal average of snow accumulation for Grand Rapids. But you can add-on our unlimited service for a small additional fee. How close do you clean to my garage door? We stay about 3’ away from your garage door. We also stay about 2’ away from any cars parked in the driveway. Services are provided November 15- April 1. Will my driveway be clean before 7 am? Although we would love to be able to guarantee a 7 am arrival time, it would be deceptive advertising to do so, as we cannot guarantee when the snow will start! Obviously the later the snow starts the later we start. For instance, if it snows 2″ before midnight then we will start at midnight so that all driveways are cleared once before 7 am. Of course, when we don’t get 2″ until 4-5 am then we don’t start until then, and won’t make it through the entire route until later in the morning. Usually by this time there isn’t enough snow to prevent anyone from getting out of their driveway. So even if you leave early in the morning before we can get there, you can be assured that by the time you get home from work it will be cleared. In the case that it keeps snowing another 2″ after we clear your driveway, we will return to do it again the following night. On large snowfalls of 5” or more, we will return the night after a snowstorm to clean out the approaches after the city has been through to plow the road. This service is free of charge. Special trips can be made during the day or with less snow for a minimum trip fee. Yes, we offer a $20 discount for signing up early. We also provide a discount if you sign up with multiple neighbors. You can take $5 off for every neighbor you sign up (limits apply). This discount is for you as well as all the neighbors. ONLY one of the two discounts may be applied. If you are signing up neighbors, call us for a discount code to use online. Payment is due in full at the time of sign up to ensure a spot on the route. Once routes are full we will no longer accept any more clients. Please go to our secure online store to see all residential services and pricing. Yes, we carry a $2,000,000 General Liability policy, as well as Commercial Auto. We also have MI Workers Compensation, and pay all applicable taxes required of a company with employees. We strongly suggest you only hire a fully insured company. What if a car is parked on my driveway? Our drivers are trained to work around cars. However, we will not clear the areas inaccessible because of the car. If you expect to have a car on the driveway when we arrive we recommend that you make sure to place it as close to the top and side of the driveway as possible to allow the driver maximum accessibility, or to move it onto the street if possible. One thing to remember is that if a car is blocking your driveway and we are unable to service the drive, if you want us to make a return trip after the car is moved there will be an additional cost. Does your equipment make a lot of noise? Believe it or not our equipment makes less noise than a traditional walk-behind snow blower! Plus, we are usually in and out of your driveway in under 5 minutes minimizing the amount of disturbance caused to both you and your neighbors. In all likelihood you probably won’t even realize we are there! Although we strive to not damage the lawn, sometimes when pulling the snow out or pushing it up there is some lawn damage caused. This is especially true when the ground is not frozen. We return to all clients properties in the spring the fix up any yard damage. We can’t accept any responsibility for things left in the driveway that are covered with snow. Do you spread salt on the driveway if it is icy? No. In the event of freezing rain or ice, it is the homeowner’s responsibility to apply any necessary abrasives or de-icers. Yes, we offer add-on services to clear the snow off city walks and mailboxes. We do not offer residential sidewalk shoveling services. Please inquire with questions. See add-ons available in our secure online store for details and pricing. All of our driveway markers go up about Mid-October and are generally removed during the first week of April – depending on the weather. Please do not throw the markers away. If you would like to remove them yourself prior to April we ask that you kindly lay them down beside your garage and we will collect them when we arrive. You will notice that we typically use one red marker with our name on it as well as wooden stakes in some cases. These markers are used to help the drivers identify your property when it is dark and snowing. It also marks the edge of the driveway. What training do your drivers receive? The most thorough training in the business! In October every year each new recruit is trained on the navigation of his route, familiarized with the technical aspects of his equipment, provided with hours of practical driving exercises, and thoroughly briefed on safety issues surrounding both the public and himself. He is supplied with both literature and hands-on training, so don’t be surprised if you see a couple of our team members out on the road pre-snow! No, the drivers aren’t crazy, they’re just practicing. We believe that preparedness reduces stress, the opportunity for damage, and the loss of time, which ultimately translates into the delivery of better service to our customers. Yes, We are always looking for reliable, conscientious, hard-working, and honest staff. Please check out the Join Our Team page for more information.